The new season is almost here! It’s been a summer of football, with the World Cup in Brazil filling the void until the real business of the nonleague season begins again. Most teams are now at least two weeks and one game into their preseason programme, and attention begins to focus on the second weekend in August, and that first league game. Managers (hopefully) have assembled the bulk of their squads by now, with just one or two additions to be made, probably based on performances in friendlies. Chairmen are hoping that their managers have used their given budgets wisely, building a group of players that can meet – and even exceed – the clubs’ ambitions and aims for the coming campaign. As for us fans, well this is the time of the year we get to dream. Dream about promotion, a cup run, or even surviving relegation if deep down we know that’s the end of the table we are most likely to find ourselves for the duration of the season. Whatever hopes and dreams we have, inevitably some will be met, some will be exceeded, and some will fall short. Which brings me to my predictions for the season ahead. Those of you who listen to the Non League Podcast (episode 41 specifically) will be aware who I’ve tipped for glory. However, I thought I would put them in writing. The Conference Premier is arguably the hardest division to get out of at any level of the game, and is a fascinating ecosystem. Clubs on their way up through the leagues come face to face with teams going very much in the opposite direction. It is always nigh on impossible to predict who will win the title, and with it the solitary automatic promotion place to the Football League. It is even harder to try and say who will finish in the playoffs or get relegated. So much can – and invariably does – happen on and off the pitch over the course of the season, that it ends up making a mockery of most “experts” predictions! Mine will probably be no different! 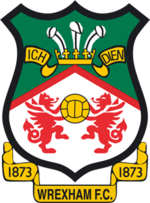 My choice for the winners of nonleague’s top flight are Wrexham. Like last season’s champions Luton Town, they have been in the division for a few years now, having fallen through the League Two trapdoor in 2008. Manager Kevin Wilkin succeeded Andy Morrell in March, and has set about assembling a squad he thinks will take the club up. They have strengthened their attack ahead of the new season, bringing in Louis Moult from Nuneaton Town and Connor Jennings from Scunthorpe United. Both are excellent strikers at this level, and if they can form a good partnership straight away, it could spell trouble for the rest of the division. Add ths to an already decent squad, and for me it’s the Welsh club who will be celebrating next April. 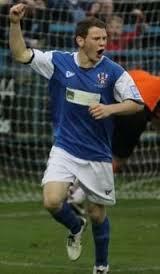 Can Connor Jennings score the goals to take Wrexham up? However, there will be plenty of competition for The Dragons. Barnet, Forest Green Rovers, Lincoln City, Grimsby Town, Braintree Town and Kidderminster Harriers among others will all have their own promotion ambitions (although internal wrangling sat Kiddie could destabilise the club). And then there are the two clubs relegated from League Two. Bristol Rovers and Torquay United have come down purely because of their results on the pitch, rather than points deductions and financial difficulties. However, it has been nearly a quarter of a century since a side won promotion the season after relegation from the Football League (thanks to @essexfootie for the research help). Darlington achieved the feat in 1990, two years after Lincoln City were the first club to do it (the season after being the first club to be relegated from the Football League. So the task is an historically difficult one for The Gas and The Seagulls. So, as usual the Conference Premier looks like it will be a very strong division, and a very tough one to win. I’ve picked Wrexham as my winners, but have also named another eight who will be looking to prove me wrong. And there will always be a team who surprise everyone (like FC Halifax last season). Am I way off? Who do you predict will take the title? And who do you think will struggle this season? Get in touch and let me know. You can tweet me (@undertheleague), or email (undertheleague@gmail.com) and Facebook (facebook.com/undertheleague). Or you can leave a comment on this article.